1. THE TILIQUA NIGROLUTEA IS A VERY INTERESTING ANIMAL; CAN YOU TELL US MORE ABOUT IT? (Vixvy Panugayan-VP) Skinks are of the lizard family. They are different from geckos. In Tagalog, skinks are called ‘bubuli’, not ‘tuko’. (Lendl Lin-LL) Blue-tongued skinks are one of the largest species in the skink family; they are called thus because of their unusual yet attractive blue tongue and smooth, beautifully patterned scales. They are mostly found in Indonesia and Australia.Although some individuals are quite nippy, they make great reptile pets. All they require is a decent UV bulb to help them absorb nutrients, and a low watt heat bulb. I personally bask them every morning, and feed them a wide variety of food. 2. 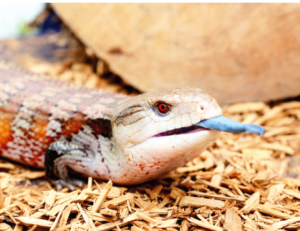 HOW BIG DOES A BLUE-TONGUED SKINK GROW? WHAT DOES IT FEED ON? WHAT ARE THE SPECIAL CONSIDERATIONS FOR ITS CARE? VP: Sizes vary, depending on what type they are. 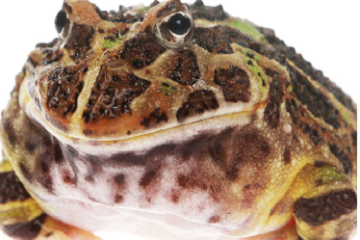 They are omnivorous and love eating insects, mice, and any vegetable. They should be kept in a container at least twice their length so they can stretch and move freely. 3. 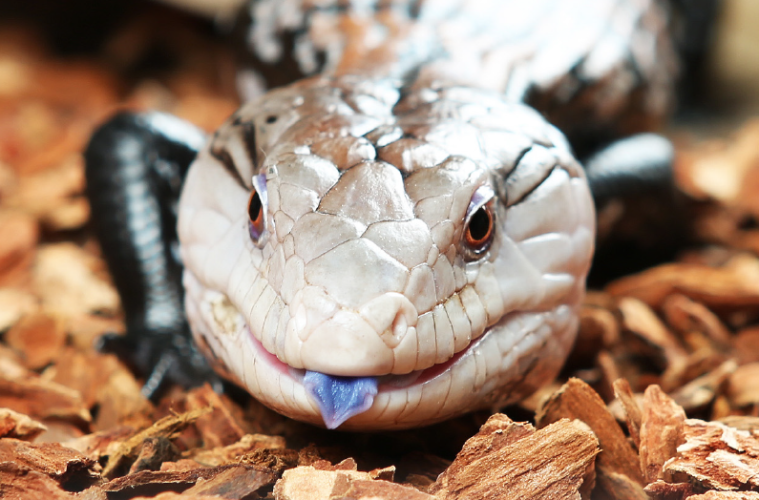 IT’S BEEN SAID THAT THE BLUE-TONGUED SKINK IS ONE OF THE EASIEST REPTILES TO KEEP; IS THIS TRUE, IN YOUR EXPERIENCE? VP: They are like garbage disposal units; they eat anything and everything that moves and has scent, and they never turn down any food! LL: They have been popular reptiles for some time now. Yes, as long as you give them a balanced diet and provide them with what they need. Some keepers feed their blue-tongued skinks high protein diets so these will grow fast, or maybe they enjoy seeing skinks eat. But we should always try to provide a varied diet for any animal that we keep, especially reptiles. Give them time to grow. 4. ARE THEY SENSITIVE TO LIGHT? WHAT OTHER THINGS DON’T PEOPLE KNOW ABOUT IT? LL: They are not actually that sensitive to light, but they can be stressed out by new environments and will want to hide. They may have small legs, but they still are strong animals and can crawl out of their enclosures if these are not properly secured. VP: They can be sensitive to light. They are opportunistic burrowers; they use any available burrow in their natural habitat, but they are not nocturnal animals. 5. WHAT CAUSES THE UNIQUE MARKING AT THE END OF ITS TONGUE? VP: It is believed that the color in the tip of their tongue is used as a defense mechanism. Sometimes, they show their colorful tongue and they hiss. They combine color and sound as warning for predators in the wild. LL: From what I understand, they use their tongues to intimidate or to bluff potential predators in the wild. I have experienced this with my pissed-off male blue-tongued skink when it saw my other large lizards. And those unique markings/pores of the tongue are more for smelling or tasting, although it can also smell through its nostrils. Flicking their tongues allows them to get a feel of their surroundings too. 6. 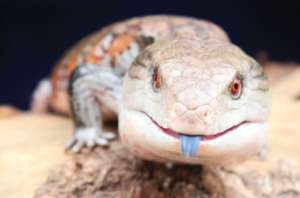 IT IS ALSO SAID THAT BLUE-TONGUED SKINKS DEVELOP INTERESTING PERSONALITIES AND CAN BE QUITE FRIENDLY; IS THIS THE CASE FOR YOU? LL: In my experience yes; after keeping them for years, I can say that they somehow get used to their handlers. They never tried to bite nor hurt me too, and they love being hand-fed. Although I noticed that Irian jayas can be a bit more nervous than the Indonesian blue tongues. VP: They are like dogs and cats that can adapt to humans. If handled and given the proper care, in my experience, they recognize who takes care of them; when I handle or bathe them, they relax. But when other people handle them, they feel uncomfortable and uneasy; they want to move out of the person’s hand and sometimes they defecate if they feel threatened. INDICATORS WHEN IT IS SICK? WHAT COMMONLY AILS THIS ANIMAL? LL: Healthy ones have clear eyes that are not droopy, straight tails, functioning limbs, complete fingers, and have no liquid/mucus discharge in the nose and mouth. I have seen blue tongues with metabolic bone diseases; you can tell from the deformed tails and unresponsive legs. Probably because of calcium deficiency and lack of vitamin D3/access to natural sunlight or UV bulbs. Some people keep blue tongued skinks in communities. This is risky because they can be aggressive to each other. It is ideal to keep them in different enclosures. – Metabolic bone disease: they need a lot of calcium; if MBD is diagnosed early, they can be treated. If you see a crooked tail or deformed legs, that is MBD, and early treatment is a must; if left untreated, they will die because they will not eat anymore. Rehydrate them with calcium if they start to eat slow. – Ticks and mites: you can use over-the-counter medicines to prevent this. Bathe them regularly, and basking is a must. 8. WHERE CAN A PINOY BEGINNER ACQUIRE A BLUETONGUED SKINK LEGALLY, AND WHAT WILL S/HE NEED? and disinfected substrate like exo terra forest bark. Never use sand as substrate. doesn’t really give the humidity that it needs. 9. WHY SHOULDN’T TWO MALES BE KEPT TOGETHER? ARE THEY AGGRESSIVE? LL: Males among big lizards, geckos, and other reptiles are generally aggressive towards each other and can be dangerous. They can kill or badly injure each other. VP: They are territorial, and most of the time, they fight for mates. If two males are in one container, they will certainly injure or kill each other; it’s not like in the wild where, if one male gains territory, the other can just run away. 10. CARE SHEETS SAY THAT THEY SHOULD HAVE UVA AND UVB LIGHT. HOW CAN OWNERS PROTECT THEMSELVES (SINCE THIS IS NOT GOOD FOR HUMANS)? LL: If you’re keeping them indoors, you should provide a nice UV bulb (20-40 watts incandescent). UV can be found in the sun’s rays, and UV bulbs help replicate these. As for heat bulbs, reptiles need heat to help them digest their food; since they are cold-blooded animals, they need heat to energize themselves. Avoid looking at UV bulbs directly. Choose UV bulbs that are safe for both humans and reptiles; the ones I use are tested. We also have a UV meter so we can check UV levels regularly. – Helps the absorb calcium, wich they need for their bones. If not provided, it can lead to complications like metabolic bone disease. Lendl Christopher Lin has kept exotic animals and fish since 2002, and was a shark and rays animal trainer at Manila Ocean Park from 2013-2014, while Vixvy Panugayan is a hobbyist who is also part of KEEP (Keepers of Extreme Exotics Philippines). This appeared in Animal Scene’s July 2015 issue. Jeffrey Lim is the Managing Editor of Manila Bulletin's Animal Scene.